Summary is that Outlook 2016 for Windows often add "weird" lines at the bottom of some table cell and those lines are coloured like the body bgcolor, so you mainly see them if your main content background color is different from your body bgcolor. This doesn't happen in Outlook 2007/10/13 and other clients. Of course this doesn't happen on Outlook 2016 for Mac, because it doesn't use Word for rendering. I started thinking it was related to the use of "cellspacing", but proved it is not only cellspacing. I thought it was my template, but I've been able to reproduce it with the Mailchimp drag/drop editor. Somehow we managed to get rid of the "1px Horizontal Lines Showing Up in the Email Body". We need to make sure the max height of any table in the email not exceeding the max height of approximately 700px. The approximate height is because we don't know the exact height which cause the issue. So, we split the whole templates into small small sections in separate tables. The email works fine even without the Outlook specific comment styles. Thanks for sharing! Unfortunately it didn't work for my email today. I believe this method fixed the same issues for me before, but not today. Your fix worked! THANK YOU! I found a few discussions about this very issue. I believe the fix will depend on how you've built your email, but I was seeing the lines appearing under a few random images. The fix I used was to apply inline CSS - border-collapse: collapse - to the table containing the image and to increase the image pixel height by one. Feels like a hack, but it's appearing to work for me. Best of luck everyone. Outlook 2016 (Version 1708, Build 8431.2236) on Win 10 PC was showing 1px gaps (they are gaps, not lines, I confirmed by changing the background color behind the table with the breakage). Specifically, breaking down long tables into bite-sized ones inside a wrapper to prevent hitting that ~700px height is what worked for us. I'm not sure that the conditional code did anything except screw up some font styling because of the font-size:0px; line. Our templates have the border-collapse code in the head as is. How do you create padding/spacing in your tables? Each "solution" works only for a specific email coding "style" so if you share the solution but not your template it will probably won't work. If I add your code to my template (see the first message of this topic) my layout break. Unfortunately i cant share the creative since it is highly confidential. But, this is how we fixed the issue as of now. 1. We wrapped the whole stacked tables into a single wrapper table with the width of the actual content table. 2. Place all the stacked tables into separate rows. There might be something to this. I know this is purely anecdotal, but I also have my templates built within a single wrapper table and rows for each of the stacked section tables - and I've only encountered the Outlook 2016 line issue once (out of ~40 emails since I started watching this issue). Hi Kathiravan, this worked for my template! Thanks for posting. At our side we can get different lines by different zooming settings (Outlook AND Windows). So it might fix it at your view, but if a customer or colleague is using a different setup (Win10 vs Win7, text-scaling 100% vs text-scaling 150%, or something like that). So even if they didn't zoom manually it might still be a different experience. Can someone confirm that zooming shows different lines? If yes, wouldn't we need to put this fix everywhere? I tried it at a single section and it prevented the line from showing for most zooming settings, but it was just moved on some others. I have no idea why this worked for me when other fixes did not, but it did! Thanks for sharing. This is possibly an issue with font-sizes. I jut ran some tests from 11px to 18px and saw the mysterious line on 13px and 17px the rest were fine. Not much time for testing this at the moment but that might sort it for you. And I've just seen adding or removing a line of text also fixed the issue, so looks like it's down to the height. I've seen the issue with heights that uses odd px values. By changing for example 25px to 26px the line is gone. style="border-spacing: 0; mso-line-height-rule: exactly; mso-margin-bottom-alt: 0; mso-margin-top-alt: 0; mso-table-lspace: 0pt; mso-table-rspace: 0pt;"
Probably luck rather than a lasting solution but anyone coming here out of desperation may as well give it a try. This worked for me thankyou! Just tested this technique successfully on another email also. Got rid of the lines by applying to all parent tables. That fix worked for me! Thanks! I thought I had this issue under control in my emails until our companys outlook 2016 had been updated to version 1704. With this update came a massive reoccurence of the 1px outlook 2016 problem, not only in my emails but in most of our benchmark mails, too. Seems like litmus hasn't yet adapted v 1704, since my email looks fine there. None of the solutions given in this thread worked, changing the table height even made it worse. I will keep trying to get around the problem and keep you posted. Has someone else experienced the problem with this version? Hi Janis - Just wondering if you've come across any solution as this has now become an issue at my company too. Thanks in advance. a colleague of mine could fix the issue by removing or filling any empty <td>s with &nbsp; in his mailing. However, this did not work for me since I have the issue with non-empty <td>s, too. As version 1705 is currently being rolled out in my company, the issue seems to have been fixed by MS - colleagues with 1705 don't see the new white lines any longer. This is only for the lines that were new in 1704, any problems resulting from not having border-collapse, padding="0" etc. still exist, but have already been addressed in our template. For me, the issue described was caused by whitespace, which was being rendered as underlines in MS Outlook. I swapped all the whitespace for & n b s p ; and managed to get rid of all the lines. Adding a & n b s p ; after a nested table and before the closing parent </td> fixed a line too. I've seen this issue happen with lots of responsive templates I've worked on recently and haven't had any success in finding a code-based solution. One thing I have noticed, though, is that if I increase of decrease the amount of copy in a table a cell by 1 line - it can make the line appear/disappear. This is just adding to the confusion for me! I'm thinking that somehow could be related as to if/when they appear, because I'm seeing horizontal lines in a current email using a master template, and I haven't come across this issue using the template previously. At this time no one found a real fix that will not involve a "trial and error" loop. There were five instances of a button link with text and chevron image. However, the issue only presented itself on the last button for some reason. To resolve the issue we found that it was caused by setting the font-family on the <td>, by moving it into the <span> contained within the <a>, the issue was resolved. Hope this is some help to folks out there. Perfect solution for my problem. Thanks! Thanks for this! Worked like a charm. yes, this glitch is indeed a crowd displeaser. If we could work out the trigger we could work against it. I have found the issue in other outlook versions not just 2016. Not sure what would cause horizontal lines though, interesting article and like everyone else would love to know what the cause/solve is! Thanks Courtney, this article helped me. In short wrapping all content block in a table with style="overflow:hidden;" on the <td> wrapping the content blocks worked a charm. Different for eveyone but this is a good solution if you can wrap all of your content blocks in it. I stumbled upon a solution that may help. It worked for me when I added it to every table in the mailer. But it seems to be due to what most people have mentioned - the wrapping table being too long. I'll try and explain this as best as I can, I have a stunted layout design which the content section consists of a wrapping table with 3 columns, the second column is only for spacing and is hidden on mobile. Now this section is repeated twice on the left and 3 times on the right - all the code is copy and pasted and then image links are changed so there's no amendments to the formatting. The bottom section of both the left and right hand side have a line between the main part and bottom part of the image, only in Windows 10 mail. I tried all the fixes on this page down to "Hazel Browns" suggestion but with no avail. Kathiravan's suggestion wouldn't let me keep my stunted design so I didn't try it until last.... but what'd ya know?! As soon as I I took the bottom right hand column section and pasted it below the stacking wrapping table, it displays perfectly! Whilst the broken sections above it remained broken. So it looks like wrapping table heights have a max height before things start to get messy, I assume it's something to do with the page breaks in the word processor but who knows. Also, has anyone seen this joke of a reply and response from microsoft? Totally ditched us.... and we're apparently helping to make it better? And ty Rody for posting this link! And ty Kathiravan for posting your fix! It's not about the "table height" as I've been able to reproduce (see the 1px line) even in very small emails. Is your issue visible only in "Windows 10 mail" or also in "Outlook 2016"? What account are you checking with Windows 10 mail (what domain)? What protocol are you using to download your email in win10? (IMAP/POP3/Exchange). I'm just testing in litmus and the problem only ever appears on Windows 10 mail - outlook 2016 is always perfect. Taking the content out of the stacking wrapper was the only thing that rectified the issue for me - now no matter how many tests I do the issue won't show up but if I pop it back inside the wrapper it breaks again. I've also tried this with other sections further up the email, swapping to make sure there were no coding differences etc. Very strange! Have you got any other ideas that we could try testing? Everything for me points to the wrapper height but if you're re-creating the issue in postcard style emails then there must be something else at work here! If you look at the mosaico.io blog post I linked in the first post here you can see the "single table code" that let me reproduce the "bug". You just need a single table with a bunch of rows.. but, this only happens with given cellspacing and given font sizes. Weird you don't see the issue in Outlook 2016: please make sure the test is on Outlook 2016 Windows and not Outlook 2016 for Mac because Outlook 2016 Mac uses WebKit for rendering and works fine. Ah yes I see! Hmm, I generally stay away from multiple rows in my tables so that can't be the issue for me. EDIT: Okay so you mentioned that it only appeared every x row right? So I added an additional spacer table above the two broken image tables, so essentially there were two spacers above it and this caused the line to move to the next section- which is totally white so it fixes the issue for my design. So from what I'm gathering, the lines appear after every "X" row, but if you build with single row tables as I do you probably won't come across the issue as frequently as you did with multiple rows. So it's not a fix but by adding an additional table above the broken elements, you can force the line to move further down your creative until you can hide it somewhere appropriate. Might be some bloat but at-least it's working. I think i have worked out the main cause of this, its due to the DPI settings of the comuter. If you change the Zoom on the computer it makes the lines appear or disapear. I ahve tried all the methods listed below and none seem to work. Any other ideas of how to fix this? Interesting article Stefano - thanks for sharing. I'd also be interested to know what the fix is. I'm struggling with the same mysterious lines - very interested in a possible fix! Personaly I take down the padding top and bottom on all my <td> (before text elements) elements & <Table>. Further more mso-line-height-rule:exactly; does the trick =) If it not works put a <span> arount the text or use <font> with inline style like above. Got the same problem (in a CTA button). When I click on the line it disappears though. And the content shifts up. Does this also happen in your e-mails? It could take a few tries, since the click needs to be on a certain spot. If you scroll to the bottom a TechNet Community Support employee says this is a known bug and they are currently investigating. But he could of course just be saying this. Changing that font-size and line-height to 1px each seems to have done the trick for me. This issue looks to me like it's caused by a table height that Outlook 2016 doesn't like (though not necessarily one that is too high, or higher than a particular threshold) because it appears on small tables too. I tried adjusting the height of the table contents by 1 pixel, and it seems to have removed the border wherever I've tried it. Example: I reduced text line heights in tables where it was appearing, or adjusted the top/bottom padding by 1 pixel, and the border disappeared. This may well be fluke, but please test and let me know if this works for anyone else? I know this post is old, but there's a really simple fix. In the past we set a line-height to 0 on <tr>'s for Outlook, however, beginning with Outlook 2016, the minimum line-height became .7pt (.75pt to be exact) which reintroduced the issue. For many emails, I've found just the code in the <head> of the document will resolve a good portion of the problems without having to use the conditional non-breaking space/zero-width space. So just test and add where necessary. I've coded thousands of emails using this, and have had no issues. This is a different issue. My sample email is shorter than 1300px and if you look at the links you'll see I'm able to reproduce the issue in very small emails. Also, the 1300px issue is shared by Outlook 2007/10/13/16 while this specific issue is only present in Outlook 2016 (Windows). I ran in the same issue this week. After scanning the inputs on this page and some tests, i can give the following input: in my case it is depending on the content (the height of the table). First i removed the line-height on the inline styles and it fixed it in some places (table heights changed by removing the line-height). If a line still appeared, i added more text above and then it dissapeared (again table heights changed). The last thing i tested was changing the background-color to the same color as the background of the content. Then no lines where visible. The additional styles in the head according to the comment from Clara Maria Løfgren fixed the issue entirely in case of my template. Thank you Clara Maria Løfgren! When I removed my font styling from the <td> the horizontal line disappeared. After some investigation I fixed the issue by changing my line-height. It was originally 15px so changed to 1 (no px). Also 14.9px worked too. interestingly any larger px value retained the horizontal glitch. For me, avoiding padding worked. Put padding and margin all 0px and use td width and height wherever you need padding. This worked for me. I have also noticed sometimes if the td is aligned middle by default with some spaces on top and bottom, it will cause white lines to appear. I used vertical-align:top and put some spaces using td height there. It seems to be a ridiculous fix though. I actually wasn't able to fix this issue permanently, but, it seems like it's somehow a calculation issue from Outlook 2016 itself. By simply adding 1px to the <td> that containing the weird line, can fix it. I tried in two of my campaigns, and it works. But I know that's not an ultimate fix. But maybe someone can figure out something more useful. When I had an issue like this I found that the line matched a bgcolor attribute or background-color style in a top level table, td or body tag. Vary those colours for a test, and then check the colour of the line in photoshop. I am experiencing what seems to be a similar problem with a 1px horizontal white line below a table/td. I figured out that this was only happening when adding a <br> or <br /> within the td. I still haven't found out a work around yet though... Example below. I have spent quite a bit of time the last two days dealing with this issue. Finally, I found out that it has to do with the ratio of the email content width and the with of the display. I reduced the size of my email from 660px to 600px and the white line disappeared. So its 2018 and this problem still persists.... 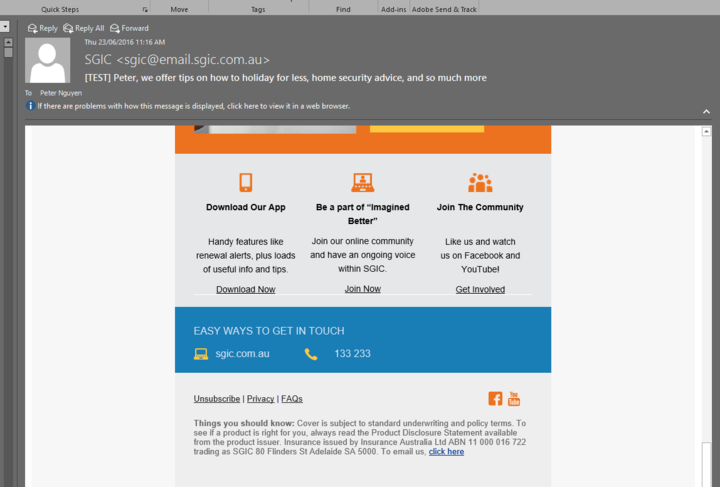 So much for Litmus and Microsoft teaming up to make email better. Can't even fix a 1px line that has been problemsome for years. 2019 and still nothing - what exactly did this litmus and Microsoft team up accomplish? I've seen ZERO improvements. My issue was unit-less values for line-height! Actually i found that this bug is related to the height of the table. If you get the line, try changing the height of your <td> by adding/removing padding or adding/removing some <br> tags. Moral of the story, Outlook is dumb, like all Microsoft products. I am having kind of similar issue but its not showing up in litmus and appears in email client outlook 2016. It looks like exactly the same issue. Part of the problem is that the lines don't always show up; sometimes closing and reopening the same email yields different results. So that is why you may not see them on Litmus, but they can pop up elsewhere. Very annoying! I haven't had time to try it yet, but it might help! Looks like the Apsis suggestion is not actually fixing/preventing the lines - they're only providing a solution to re-color the lines to match your content background. More of a hack than a fix. I've been able to solve this by adding style="border-collapse: collapse;" to the tables surrounding the line. Give it a try. How do you keep applying cellspacing/cellpadding (padding / border-spacing) using border-collapse: collapse ? BTW, I think you have only been lucky... when I experience the 1px issue I do some really minor change around and the 1px disappear (or moves somewhere else). I updated Outlook to the latest version - Build 1705 8201.2102 - and the lines went away. Using Windows 10. In my experience Outlook 1705 8201.2102 changed something: some 1px lines disappeared and some other 1px lines appeared. The issue is still there, it just changed the random seed. So you have just been lucky... I had emails with no lines in my Outlook 2016 inbox and now reopening them with build 1705 8201.2102 I see the bad lines . style="border-collapse: collapse; border-spacing: 0; mso-line-height-rule: exactly; mso-margin-bottom-alt: 0; mso-margin-top-alt: 0; mso-table-lspace: 0pt; mso-table-rspace: 0pt;"
I can concur with Julie; the new update appears to have fixed the issue, certainly displaying on two PCs we have here. This removed all noticeable 1px lines for me instantly. I tried adjusting line-heights/font-sizes/padding as per other recommendations, but this is the only method that has worked for me. I've seen this happen when applying padding to an element (td in my case) that has direction: rtl/ltr set on it either in CSS or as an attribute. Not sure if that's what is happening here or not. Moving the padding to another element nested inside usually fixed the issue. For Outlook 2011 OSX the location is border top not bottom and is light-gray not background color. Also rare in appearance. For Outlook 2010 sometimes I get both a border bottom and border top, the top light gray and the bottom the color of my email background. The lines appear to be more frequently showing, at bottom of row spans, especially where columns are empty (gutters). Uncollapsing these rows doesn't fix the issue either (in case you are thinking I should try this). I have tried border:none; and border:1px solid transparent; also the usual background-color changes as many suggested and I can't get traction. My design has alternating color blocks so a one color fix for background won't work. The only solution that has improved the appearance is to mask (paint over the lines) by applying a border bottom inside the empty rows with a color that matches the background table color. Such a time waster this bug.